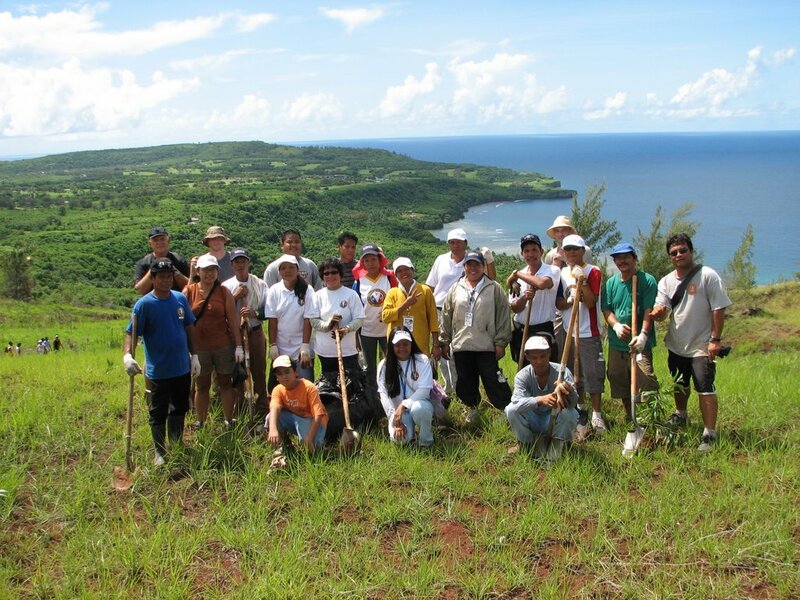 Super volunteers Kyle Kaipat, Josiah Lizama, Juanita Fajardo, Adam Sablan, and Captain Carl Brachear pose after the planting. 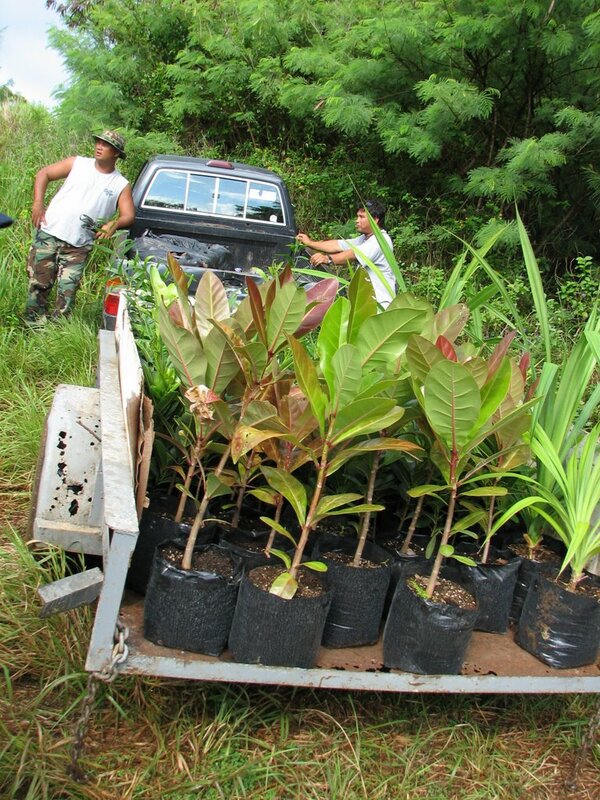 They have participated in every single one of our plantings so far. We will plant trees on the hill in the background in two weeks. That planting should finish up the Lao Lao project until next rainy season. 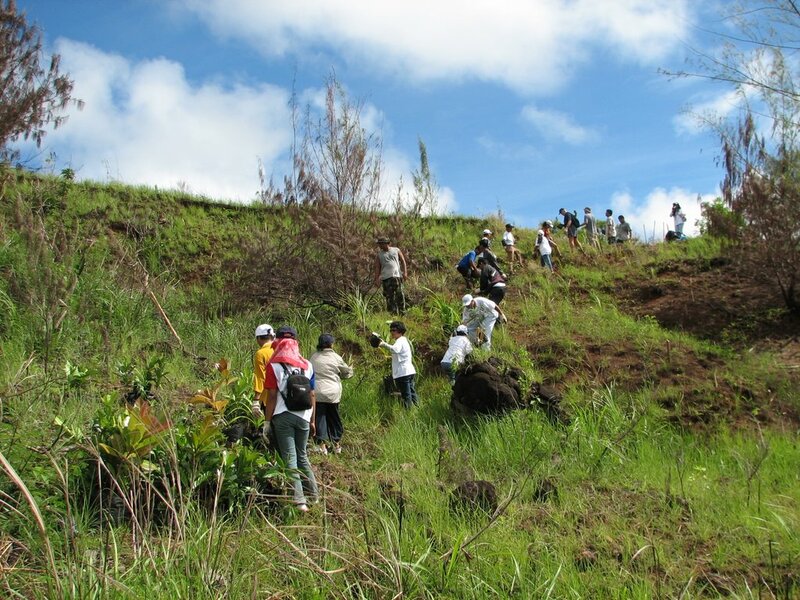 You can probably surmise from the first photo in this post that we had another planting this morning up at the Lao Lao revegetation project. 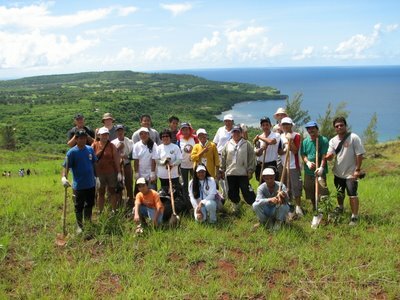 29 volunteers and staff from RC&D, CRM, DEQ, and CNMI Forestry participated in this morning's plantings. 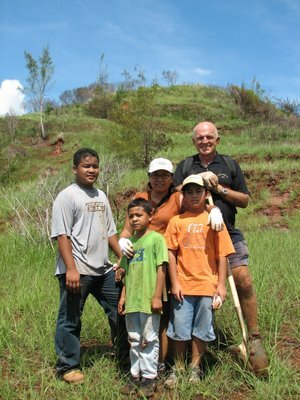 Tim Lang of CRM, Jeremy Shaw of DEQ, and Ben Cepeda and James Babauta of CNMI Forestry led the planting (with a little help from me). We drove the 146 saplings and 400 putting seeds to the start of the trail leading to the revegetation site and the volunteers and staff carried them up to the top of the mountain. 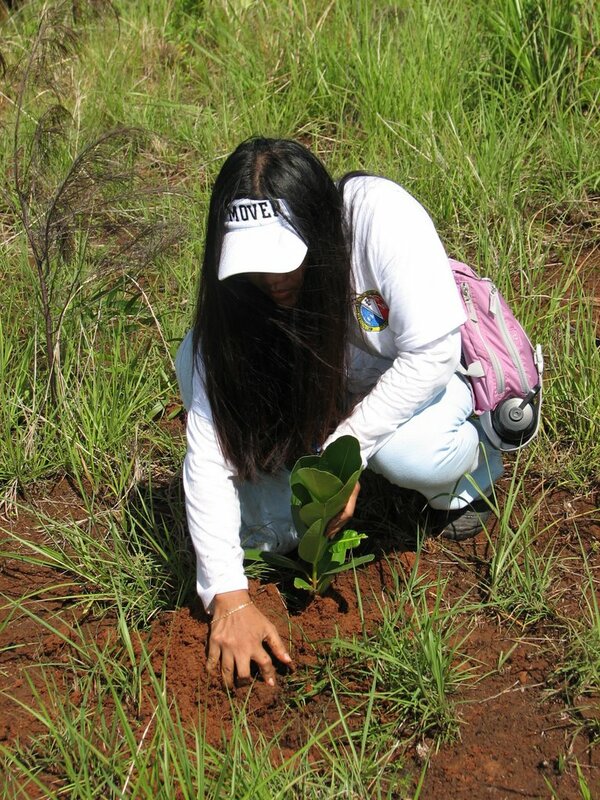 We've already planted a considerable number of trees (575! 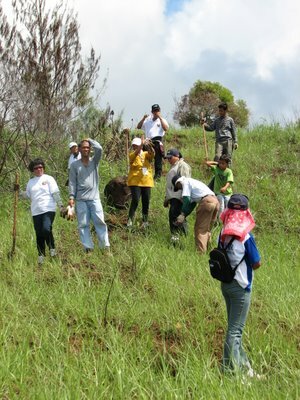 ), so we had to carry the trees further into the revegeation site. We had to form and reform a human chain three times to get the trees to where we wanted to plant them. 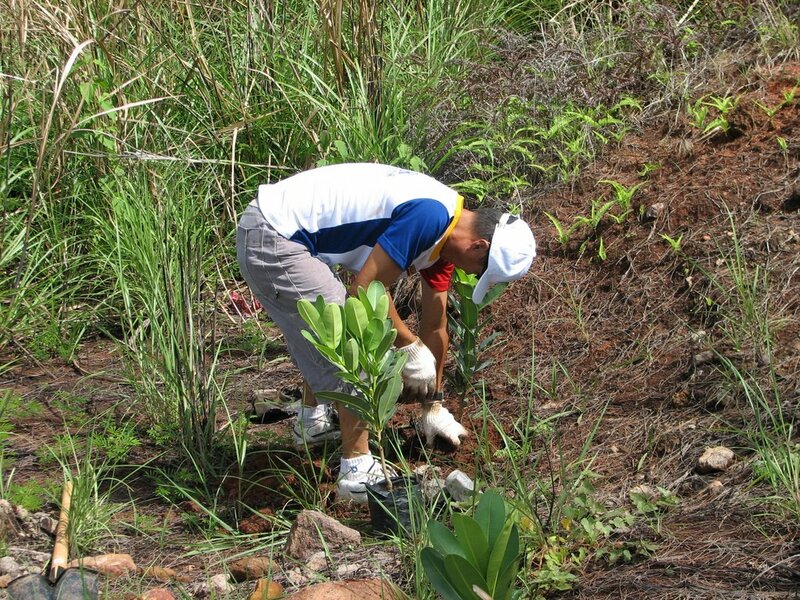 Another factor making this planting more difficult was the size of the saplings. 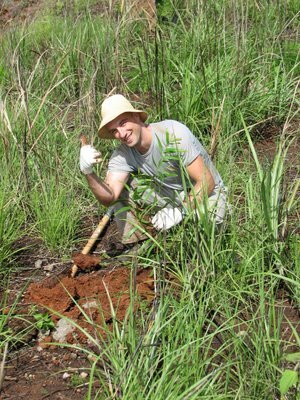 Many were bigger than previous saplings. Some of them were in 3 gallon bags. Do you know how heavy 3 gallons of soil is? 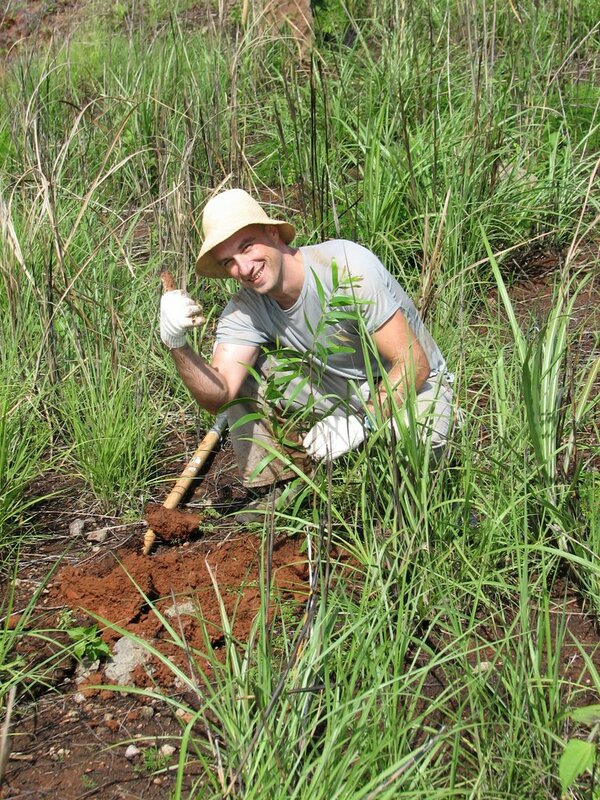 In addition to the 146 saplings, we also broadcast 400 putting seeds. 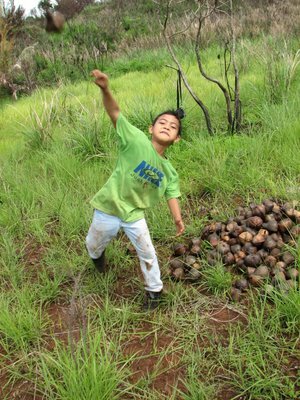 This is how the broadcasting works: Angelo carries a hundred pound bag of seeds up the mountain (each seed is about the size of a baseball) and then Josiah broadcasts them in every direction. See the photo below for a visual. During the planting, Adam said to his Mom, "look, a grenade!" The fighting on Saipan stopped on July 9, 1944. 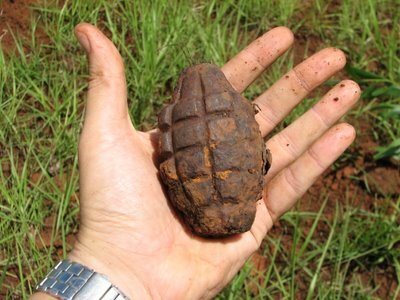 This grenade has been sitting on the Lao Lao hillside for over 62 years. Great find, Adam! Once again the volunteers from MOVER did an amazing job with the planting. This was the sixth consecutive week of plantings for them. Thank you, MOVER! As we posed for our post-planting picture, a group of about 15 kids showed up at the revegeation site. They were on a hike being led by one of the teachers that participated in the Outdoor Classroom Experience with Koblerville Elementary School. I was really happy to see her bringing more kids up there. That means that our program is actually working!